All stories have their origins in unique places - and ours began in cargo area of the Nashville International Airport. While my husband waited in the truck, my daughter and I, accompanied by a friend who couldn’t wait to see me with something other than a Lab, lingered and loitered and paced at the Delta Air Freight area, much to the chagrin of their employees, until a little crate was brought off the plane. Peering into the crate, I saw a little mass of brown curls staring back at me, blinking slowly and inquisitively, wondering what the heck had just happened to him and where his littermates and mother had gone. Soon we were treated to puppy kisses and our journey with Rudy (named after the Notre Dame player who wouldn’t give up on his dream - we figured a little brown guy would need to be tough to survive being with the Labs) began. Actually, there were many events leading up to the arrival. I must admit that I’ve always been a Lab person. Being born and raised in Arkansas Delta in the heart of duck hunting country, I watched with great admiration how the local hunters, during the first crisp days of autumn, started training their dogs. They worked to sharpen their handling skills and polish up marks with keen anticipation of returning to the duck blind - while visions of swarms of ducks danced in their heads. I listened carefully to the tales told from the blind, post-hunt. I heard the tales of impossible, heroic retrieves, saw the bond and partnership that formed between hunter and dog, and mourned with them when their beloved companions passed on. While I wasn’t able to have a dog of my own, I knew in my heart that I would have a Lab when the time was right. "Observing as the lightbulb turns on and seeing the manifestation of the longing bred into him, noticing him answer the call that lurks deep within his brain, his heart, in every fiber of his being is truly inspiring." That day did come... repeatedly. I have now owned or co-owned six Labs and have enjoyed participating in conformation (yep - I’m one of those but I’m not too successful at it), obedience and hunt tests with my Labs. They are wonderful family companions, are a big part of my daughter’s life and I hope that I am always able to be able to share my life with these wonderful dogs. But somehow I wanted something... well, a little different. I have a friend who is very devoted to English cocker spaniels. I was impressed by their birdiness and tremendous willingness to work. I watched with envy as she loaded her 300-sized crates in my truck before we set off on our own adventures. Then I have another friend and training partner who has Boykins. 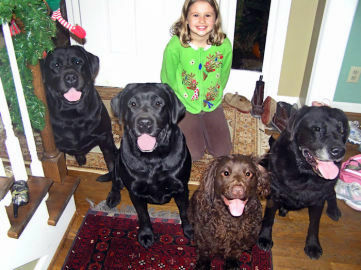 Her little brown dogs charged after birds with reckless abandon, bravely fought through thick cover and plunged into the ponds with great courage. And did I mention that she could fit two in the space where one of my Labs went? The inquisition began. 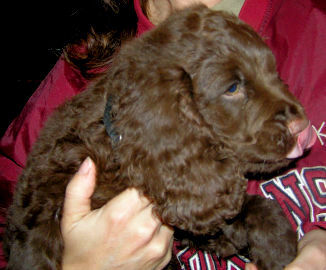 After hours at the computer and conversations with very patient spaniel owners while considering compatibility with Labs and grooming requirements (I’m a very low-maintenance kind of person), I decided to pursue a Boykin or an American water spaniel. Dipping my toe in both waters, I talked with people who were very dedicated to both breeds. A personal message from Gerda Smith of Wine Country Kennels in New York resulted from a post on a message board, and from there a friendship bloomed. She was very open and honest with me about the breed’s strengths and quirks, and after we’d talked several times, she said she had a litter on the ground. After further discussion, we decided to take a good-sized male. Our Rudy has lived up to his namesake - except that we feel he has more natural ability to play his chosen sports. Training my spaniel has been a delightful challenge. It is great fun to watch the wheels turn in the little brown head as he begins to come up with his version of the best way to handle the task at hand. They are an interesting dichotomy - toughness in one sense, softness in another - especially when corrections need to be administered. I was told to carefully introduce him to water, so in the spring when the ponds warmed up, I carefully waded out with him and let him splash in to me. After about three tries, he noticed a plastic cup floating in the pond and swam well past me to get the more interesting item, so I figured that water would not be a problem. And so far it hasn’t. He passed his first started HRC test at the age of ten months, but went to the line on two back legs. So we’re going to back up and work on obedience before proceeding further. Did I mention he has plenty of desire? On his first birthday we went with Anne, our Boykin friend, to our farm in West Tennessee for a day of quail shooting. Rudy watched on lead while her Boykins flushed and retrieved the birds my husband shot, then finally, eagerly, went for his turn. Watching a dog do what he was bred to do is a beautiful sight. Observing as the lightbulb turns on and seeing the manifestation of the longing bred into him, noticing him answer the call that lurks deep within his brain, his heart, in every fiber of his being is truly inspiring. Nose to the ground, he clumsily worked out his quartering pattern at first, his little body quivering with eagerness to do something, his brain following paths it seemed to be simultaneously creating and remembering as he went. As he drew closer to the bird, the path became a little more determined - as if his ancestors were somehow whispering to him that this is his job, this is what he is to do - to find that bird and put it in the air. His eyes took on a look of steely determination as suddenly, with a flutter and flash, he put the bird up. Hubby dropped the bird quickly (good thing - sometimes the Fates play nicely), and Rudy triumphantly returned to me, bird in mouth, chest thrown out, head held high. This, he assented, this is my job... and it’s cool! OK, I’m hooked now - I am a spaniel person. Here’s to more adventures and a long journey together.